Heather Mac Donald once wrote a book titled “Are Cops Racist?” Just looking at that title shows it’s an unfair question. Just about any answer can be a correct one. 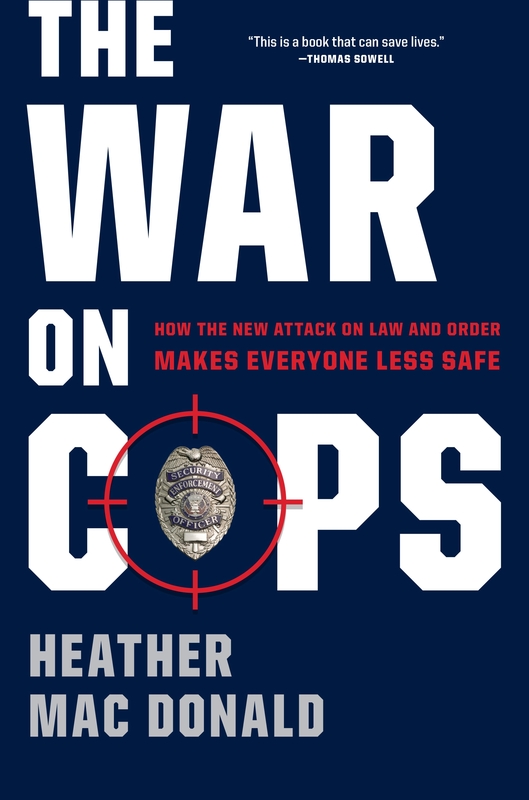 Her latest book is “The War On Cops — How The New Attack on Law and Order Makes Everyone Less Safe.” The title is more reasoned, but still seems to leave nuance out. Mac Donald is an established journalist with credits in print and TV, and the confidence of supporters and people at various governmental levels. But that doesn’t mean she’s always right. And from what I read in this book, I think she’s got it wrong. I found that she writes primarily (at least in this book, which is the only one of hers I’ve read) with a passion and emotion that detracts from a calm and considered examination. When I say she goes to the emotional, I’m referring to things like chapters titled, “Obama’s Ferguson Sell-out” or “The Big Lie of the Anti-Cop Left Turns Lethal.” These inflame rather than intrigue. It’s people raising fists above their heads and screaming in unison instead of tenting fingers in front of their faces and thinking. I found the use of adjectives troubling: Officer Darren Wilson vs “thuggish” Michael Brown. I have no opinion on whether Wilson’s shooting of Michael Brown three years ago in Ferguson, Mo., was justified or not. I only have what I saw on TV or read in papers, which was like drinking from the proverbial firehose. But I have an opinion on how it’s presented in this book and that’s that it is manipulative and tilted. Wilson/Brown is not the only interaction discussed, but it’s typical. Black people vs. white police is a tough subject. Any discussion needs context almost like rules-of-engagement. Mac Donald says police arrest more blacks than whites because blacks commit more crimes. But statistics can lie or at least trick, so the examination can’t stop there. It’s too much to consider in a 230-page book (or a 600-word review). But before I closed the book and put it aside in disappointment or dismay, I found Mac Donald devoted much of the second half to a thoughtful and balanced analysis of prison and jail systems, still considered in light of her earlier theses. So, on balance, this book is worthwhile for police and security personnel, but solely for readers capable of thinking critically enough to see through emotional rhetoric and assess the logic for themselves. “Assessing the logic” is a required skill in our world of “fake news.” And by “fake news” I am not necessarily referring to made-up stories but to rhetoric. A police or security professional’s ability to see through this and understand truth is a new must-have. Journalists can play roles on every notch along the political continuum. Watch out for that and think for yourselves, folks. Mac Donald’s book needs people to believe there is a “war on cops” but there’s not. There are bad guys out there warring on cops, but there has been ever since policing began. This book wants people to believe no cop ever killed anyone unjustly, deliberately, but that’s not true, either. There are bad cops out there … ever since policing began. Hundreds of books might not solve this historical challenge any faster, but even a single book can delay that eventual resolution. Derek Knights, CPP, CISSP, CFE CIPP/C, PCI, is the senior manager, strategic initiatives, global security and investigations, at the TD Bank Group (www.tdbank.com).